Where to Job – Part 1: Well-known Post Production Studio or Small Scale Post Production Studio? During your job hunting or even if you are already on a job, you might come at the cross path. At the same time you got 3D or VFX job opportunity from famous and small scale post production studio. How will you choose? It is one of the most sough after question from digital artists on our Animation and VFX blog. There is no easy or one-fit-to-all answer for this. It varies from artist to artist. 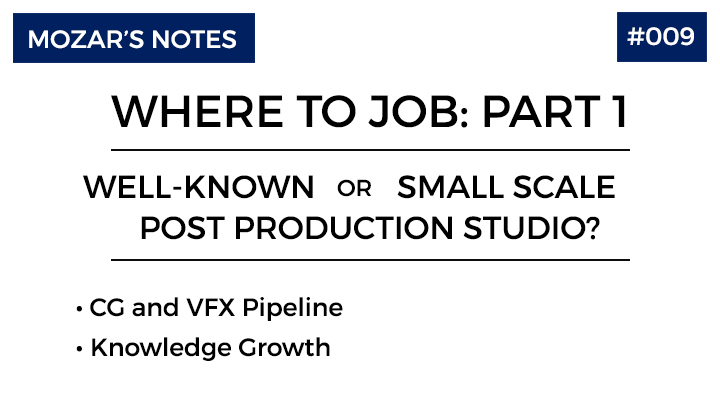 Check out various parameters of famous and small scale Post Production Studio in the learning series of “Where to Job”. Choose the best option according to your skill set and future goals. The giant post production houses like Prime Focus, Prana Studios, EFX Prasad, Red Chillies VFX and others follows production pipeline very strictly. All the categories and sub categories of various 2D, 3D and VFX modules are properly defined and pre-allocated to concerned departments. As per movie quality and budget; they modify existing pipeline in terms of operating system platform, software with their specific version, 3rd party and in-house plugin / macros / gizmos and so on. The system is above the artists. Everyone works in an assigned workflow. For every 2D, 3D or VFX project files; they have to maintain naming convention, number padding pattern, file format, layer and node based tree structure hierarchy, text notes and other industry standard data. Each team is given specified shots to complete within stipulated timeline. It is quite possible that there are various projects running at the same time. So, it is must to have some senior digital artist in every team to troubleshoot the problem. Verdict: You get exposed to industry standard tools and techniques. But, the artist is replaceable. Small scale post production facility is a team of handful key people who are 3D or VFX generalist. No big flashy furniture or refreshment places are found here. The money is invested very wisely on software purchase and licensing, computer configuration and data storage units. Small scale studios are mainly dependent on artist rather than the system or pipeline. All the artists works as a team, on a multitasker way. Every digital artist performs wide gamut of production and management operations single-handedly as the team strength is minimal. Verdict: The emphasis is here to get the project done in timeline, rather than strictly following the pipeline. Multiple software’s might be used as per artist’s comfort level even for a single shot. This is the most ironic part of working in giant post production companies. You work only in the department you are assigned for. There is not room for new learnings out of your deadlines. If you finish your assigned shots, other project is ready in pipeline for you. So, your work goes in cycle only. You gain specialized knowledge and information only in one module of the entire workflow. You cannot escape it easily as you are assigned in one team. This is the reason, these studios are called as ‘Factory‘ or ‘Mill‘. Verdict: You don’t understand the entire pipeline. If you don’t interact with your seniors, you will never know how your output is used in sync with other artist’s works. Knowledge growth is multi fold here. All the artist can see the big picture of the entire project. The artist becomes the one man army. He/she knows exactly for whom they are working and how their contribution is going to be used in the final output. The artist can switch to any other department once he/she finishes the assigned work. You can take as much work pressure as you can achieve.Ultimately it makes you CG or VFX generalist. Verdict: It’s a fast and better way to learn and continuously be progressive. He/she understand the entire pipeline, from scratch to final output.